The Leukomed Sorbact Waterproof Dressing for Infected Wounds provides long lasting protection against infection and contamination in minor to medium sized infected or non-infected wounds, cuts, grazes and abrasions. The sterile dressing acts to remove bacteria from infected wounds while offering protection for non-infected wounds against external contamination. Breathable and easy to apply, the latex-free Leukomed Sorbact dressing provides long lasting comfort for minor to moderate wounds and injuries. Leukomed Sorbact's microbial binding technology safely and effectively binds bacteria and fungi without the use of a chemically active agent. The infection management mechanism acts to minimise the risk of infection and remove bacteria from infected wounds and injuries. The breathable Leukomed Sorbact Dressing utilises a waterproof adhesive film to provide secure and long lasting protection. 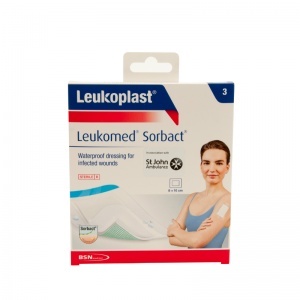 The Leukomed Sorbact's strong adhesive ensures the dressing can be used while showering and a range of other activities.